But before we focus on Sunday, let us first praise England for yesterday. After a opening 15 minutes in which they were still beset by big match nerves, Defoe pounced on a sumptuous ball from the right by James Milner to ease the pressure and free the troubled minds of the England team. The Slovenian keeper, Samir Handanovic should have done better with the goal - turned in off Defoe's right shin - but it would be harsh to single Handanovic out for criticism, given that his superb performance was a major factor in keeping the contest alive right up to the final whistle. Fabio Capello was as animated and anxious as he has ever been in England's technical area. While the demands of the fans, media & punditocracy mean little to the Italian, it was clear to see that he has put himself under a great deal of pressure at this World Cup. He knew that failure here would be disastrous. Capello has often stated that his target in South Africa is to reach the final, and he did everything bar join his players on the pitch in ensuring that it remained a possibilty. When the final whistle blew the relief on Capello's face spoke volumes. He embraced his coaching staff and players, fully aware that England have made a pig's ear of what has been arguably the World Cup's weakest group. I would also be surprised if Capello didn't derive some pleasure from the fact that his changes - while not ones that the English public wanted to see - all made key contributions to the victory. Capello rolled the dice last night and came out with a double six. Once England had the lead, they slowly began to settle on the ball. Early on it seemed that no-one had told the back four that Emile Heskey wasn't playing in this match as they hit an alarming and absurd amount of long balls up to the diminutive Defoe. But after he scored, the tempo increased and England began to keep the ball on the floor, playing nicely through midfield. Gareth Barry was key here, constantly making himself available to the England defence, negating the need for them to go long. Steven Gerrard played intelligently occupying the inside-left channel and Milner had obviously gained a great deal of belief from his assist, as he made a habit of delivering testing balls from the right-wing after that. Knowing that a second goal would be necessary to be in complete control, England played some delightful football as the second half began. In a six minute spell Defoe, Wayne Rooney & an inspired John Terry were denied by a combination of poor finishing and top class goalkeeping from Handanovic. This was England's best spell of the game, and it is this that Capello must focus on during the two days of training England have before facing Germany. As the finishing line was in sight, England's concentration began to waver. They began to pick the wrong pass, and their high-tempo pressing game left the players fatigued. With both Capello and keeper David James imploring England to defend higher up the pitch, the last 15 minutes were fraught with Terry, Glen Johnson and Matthew Upson all required to make goal-saving blocks to preserve the lead. 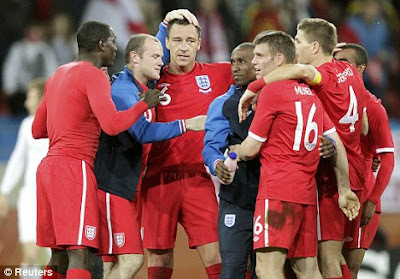 Like they were against the USA, England were short of killer instinct and they can consider this a final warning. America's last gasp win against Algeria ensured that they won Group C at the expense of their former colonial masters. It has sent England into the tough half of the draw. This was not part of the plan, but England have to now make the best of a far from ideal situation. While Germany will go into Sunday's match as favourites, they are eminently beatable. In 2008, England defeated Germany in a friendly match in which the Germans were played off the park. It was one of England's best performances under Capello. The likelihood is that they will need to produce something similar for this World Cup not to be remembered as a failure and we must remember that regardless of the nature of the opponents, England will not (and should not) be satisfied with what they have achived so far. Elimination from the last 16 would constitute underachievement for this squad. All that happened yesterday was that England have laid a foundation. It will do us no good fretting that this foundation has arrived almost two weeks too late. The car has finally started after two false starts, and it would be a pity for it to run out of petrol in 3 days time.